Jasmine Smith, Kelly Gomez, Jessica Davis, Angelica Cortes-Rivera. iConference 2018. Sheffield, UK. Abstract: Traditionally, museums have been spaces where visitors are asked to look but not touch items on display. 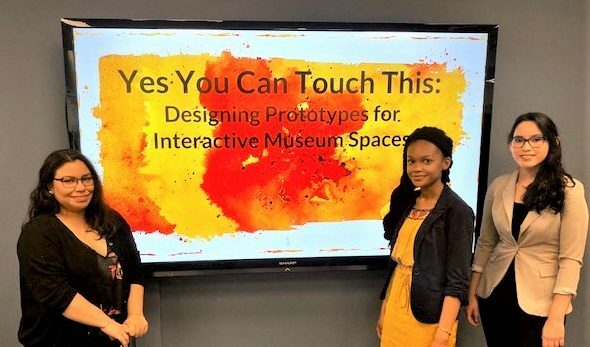 Currently, professionals in museums, particularly in the United States, are trying to improve visitor experience by using interactive displays and technologies. Interactive media allows visitors to be immersed in the information displayed rather than simply reading a block of text that would more than likely be overlooked.While interactive media is a great way to engage visitors in an exhibit, this study looks at the use of interactive media in preserving culture, specifically American indigenous cultures. Our goal is to study how culture can be preserved and shared through interactive prototypes in a museum space.